The U.S. government's crackdown on whistleblowers is a direct threat to our efforts to reform U.S. foreign policy to make it more just. If we don't know for sure what the U.S. government is doing, we cant have an effective democratic debate about what U.S. policy should be. Faced with the threat of persecution by the U.S., NSA whistleblower Edward Snowden has applied to the government of Ecuador for political asylum. Join Oliver Stone, Noam Chomsky, and Tom Hayden in urging President Correa to grant Snowden's asylum request by signing the petition below. We write to urge you to grant political asylum to whistle-blower Edward Snowden. 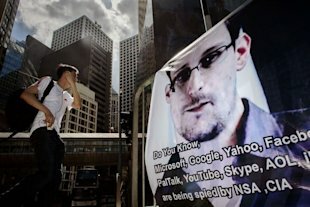 Snowden's disclosures have already done much to unveil the alarming scale of U.S. government spying on its own citizens and on people around the world. They have revealed severe overreach by the U.S.' National Security Agency (NSA), which seeks to gather an overwhelming and invasive amount of information on people within the United States. Snowden has also revealed that the constant NSA surveillance also applies to millions of people outside the U.S., whose phone calls, emails and other communications are also indiscriminately targeted. These are severe abuses of the basic constitutional rights of U.S. citizens and the rights of people in other nations. Yet rather than focusing on the danger to citizens' freedom and privacy exposed by these revelations, and what reforms are necessary to protect citizens' rights, the Obama administration, the U.S. Congress and much of the media are again focusing their ire on the messenger - the brave whistle-blower who, at great personal risk, decided to step forward and inform the U.S. public about what is being done in their name and what is being done to them. Sadly, a great deal of the media and other institutions that should play the role of watchdog have largely abdicated their responsibility. We have seen this drama play out several times before under the Obama administration. The administration has charged more than twice as many whistle-blowers under the Espionage Act than all previous presidents combined. These have included Thomas Drake who also exposed wrongdoing at the NSA, and most notably Private Bradley Manning, who stands accused of providing Wikileaks with information that revealed U.S. war crimes, U.S. meddling in other countries' affairs, and other grave and troubling misdeeds. Manning was held for three years before his trial under conditions that a formal U.N. investigation found to be "cruel, inhuman and degrading." Many of us petitioned last year for you to grant political asylum to Wikileaks founder Julian Assange. Assange, who as you know well, has been targeted by the U.S. government for publishing evidence of U.S. war crimes - most notably the "Collateral Murder" video of a U.S. helicopter attack on civilians in Iraq - and other information embarrassing to the U.S. government. The Obama administration's consideration of Espionage Act charges against Assange and Wikileaks, via a grand jury, and bellicose rhetoric by top administration officials and members of Congress, amount to a chilling assault on freedom of the press. We were glad to see you act to support this vital freedom by recognizing Assange's political persecution and granting him asylum and refuge at the Ecuadorean embassy in London. As could have been the case with Assange, Manning's treatment since his arrest shows that Snowden could be subjected to cruel and unusual punishment if he were taken into U.S. custody. There is also a grave danger that Snowden would have difficulty in receiving a fair trial in the U.S. - a point he reportedly has made in his petition for asylum. Manning's case also shows that Snowden's constitutional right to a "speedy" trial might also not be secure. These are all serious examples of political persecution against Manning that may await Snowden if he becomes a U.S. prisoner. It is no doubt your courageous decision to grant Assange asylum that has encouraged Edward Snowden to also seek asylum in Ecuador. Your choice in Assange's case was not without consequences; the U.S. and U.K. governments reacted angrily, with British police keeping Assange confined to the embassy. Since Assange is being targeted by the U.S. government, there has and no doubt will be more political repercussions. You knew this and yet you acted in the name of justice, saying "Latin America is free and sovereign and... we'll not put up with meddling, colonialism of any kind, at least in this country, small, but with a big heart." Charging someone with espionage, who clearly did not commit espionage, is strong prima facie evidence of political persecution. The unprecedented quantity of whistle-blowers that have been charged under the Espionage Act by the Obama administration suggests that it is applying this law in a completely arbitrary fashion. In Snowden's case what he has revealed are actions by the NSA that violate the U.S. Constitution's Fourth Amendment protections against "unreasonable searches and seizures." There is no evidence whatsoever that his revelations have in any way threatened U.S. national security or were ever intended to do so. Yet rather than pursue reforms that would protect the rights of people in the U.S. and around the world, the Obama administration again seeks to silence those who have brought these abuses to light. These are actions of political repression, and you would be right to grant Snowden political asylum. The story of Edward Snowden and how he got to be in a position where he could leak details of the National Security Administration's (NSA) surveillance program is revealing a great deal about the privatization of our national security system. Much of what we are seeing is not pretty. First, I am not condemning Mr. Snowden. To my mind he provided a great public service at enormous personal risk. The terrorists surely knew that the government was tracking them. The news in Snowden's leak is that the government is also tracking everyone else. This sort of surveillance should be subject to careful scrutiny, which is not the case now. By making the government's pattern of surveillance public, Snowden at least created the possibility that it would be reined in. However, apart from the extensive system of surveillance at the NSA, Snowden has also called attention to the extent to which national security operations have been privatized. Of course, Snowden did not work directly for the government; he worked for Booz Allen Hamilton, a private contractor. Booz Allen is a $6 billion a year business. It gets the vast majority of its revenue from government contracts like the one that paid Snowden's salary. While the specifics of Snowden's work are not clear, we know that he was being paid more than $120,000 a year. That's pretty good pay for someone who just turned 30 and never graduated high school. Needless to say, Booz Allen was billing the taxpayers even more for Snowden's work since they are in business to make a profit. Snowden may have had extraordinary skills that would justify this sort of pay, but there is no way for the public to know. It turns out that even the background check that provided the basis for Snowden's security clearance was done by a private contractor. USIS, a company based in northern Virginia, did the background check on Snowden and many other people with security clearance. In the last two decades, private corporations have come to play a large role in a wide range of national security tasks. This is troubling since private companies are answerable to their shareholders, not the general public. There is an obvious logic to having private companies provide many of the goods and services used by the government. It makes sense to have private companies produce the cars, the computers, the office paper and other standardized items that the government uses in large quantities. These are all well-defined products that the private sector produces in large quantities. There is no reason to believe that the government could somehow produce better or cheaper cars than Toyota or computers than Dell. But when it comes to very specialized services, the case for the superiority of the private sector is more questionable. Naturally, private firms will try to maximize their profit by providing the service at the least possible cost. This could mean skimping in ways that really matter - for example not doing a thorough background check. The agency that hires a private contractor has the responsibility for doing the oversight, but extensive oversight increases the cost of the contract. The problem of oversight is likely to be especially large in the case of national security operations like the one employing Snowden. Because of the secret nature of the project, there will be very limited opportunities for public scrutiny. That means that the government supervisors have an especially large task in ensuring that the government is getting its money's worth. This can be especially difficult when powerful figures in government have pet projects or cozy relations with the contractors. This sort of situation is virtually a recipe book for corruption. Unfortunately, over the last quarter century there has been a virtual cult of privatization in Washington. The cult has been bipartisan. The Clinton administration used to brag about its reduction in the number of government employees, which was often accomplished by hiring private contractors at greater expense. The Bush administration carried this privatization drive much further. It is necessary to view this issue with open eyes and an understanding of basic economics. Companies are in business to make money. If the government cannot have proper oversight, as is likely to be the case in many areas of national security, the only way to ensure that the public is not being ripped off is for the government to do the work itself. Otherwise, we are setting up a national security apparatus that is likely to be a cesspool of corruption and waste.